The yen has plunged against the dollar this year on hopes that the Bank of Japan will boost the nation's sagging economy. The Japanese yen fell to a four-year low against the U.S. dollar on Thursday as investors continue to welcome moves by the Bank of Japan to boost the nation's economy. The dollar rose above ¥100 for the first time since April 2009. The move was driven by renewed optimism about the U.S. economy following strong readings on the nation's job market, said Kathy Lien, managing director at BK Asset Management. The number of Americans filing for jobless benefits fell to a five-year low last week, the government said Thursday. That added to enthusiasm over last week's better than expected April payrolls report. "We're seeing a broad based dollar rally," said Lien, adding that the yen was steady versus the euro. "You can attribute the overall trend to BOJ policies, but this immediate move is more about the dollar." Lien said the dollar could hit ¥105 as a growing number of global central banks have cut interest rates recently. South Korea announced a surprise interest rate cut Thursday. That came after the Reserve Bank of Australia cut rates to a record low Tuesday. The European Central Bank lowered its benchmark rate last week in an effort to prevent a deeper recession. "All of this creates demand for dollars," said Lien. 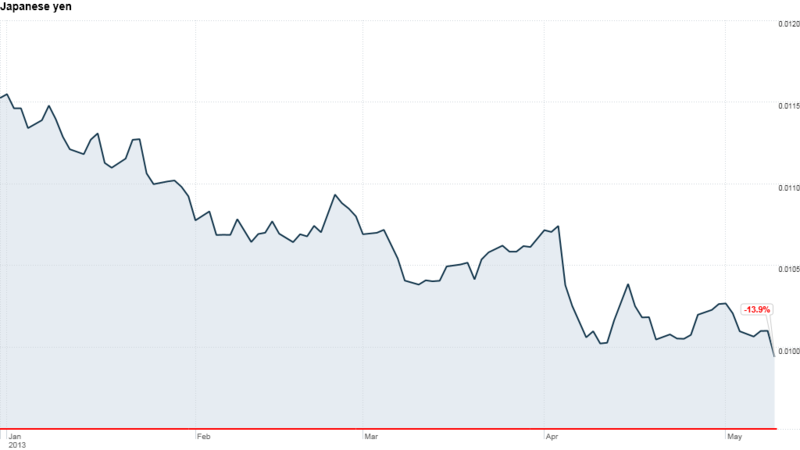 The yen has plunged 14% against the dollar so far this year as Prime Minister Shinzo Abe has pushed the Bank of Japan to stimulate the nation's economy. In an effort to fight deflation, the BOJ has pledged open-ended purchases of longer-term debt and more exotic securities like ETFs. The new purchases -- made at an annual pace of 60 - 70 trillion yen -- will double the bank's monetary base over a two-year period. Japan, the third largest economy in the world, has been mired in deflation for a decade. Abe wants the BOJ to do "everything possible" to achieve its target inflation rate of 2% as soon as possible. The move to devalue the yen, which makes Japanese exports more competitive on the global market, has raised concerns about a currency war. But officials in Japan say the yen's depreciation is a healthy correction from the record highs from 2008, when investors flocked to the currency for safety. Japanese investors have welcomed the weaker yen as well. The Nikkei has surged more than 36% this year. Shares of leading Japanese companies such as Sony (SNE), Toyota (TM) and Kirin (KNBWY) have soared on hopes that a weaker yen will boost overseas sales and corporate profits.